Lucy Walker was born in Canada and raised in Liverpool where her father was a lead merchant. 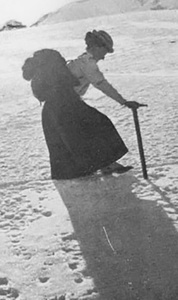 In 1858, as a suggested cure for rheumatism, her doctor suggested she take up walking, so accompanied by her father and brother she started climbing in the Alps and became widely credited as the first female Alpine Mountaineer. Lucy scaled both the Theodul and Monte Moro passes and the following year, wanting to build upon these experiences, expressed a desire to climb the Altels, a 3,629m peak in Switzerland. Her father suggested Melchoir Anderegg as her guide, who later became the only guide she ever climbed with. The climb was a success and so began her mountaineering career that quickly progressed as she completed a number of significant routes, notably the Dufourspitze, Mont Blanc, the Eiger, Rimpfischorn and the first ever ascent of the Balmhorn (3,698m in the Bernese Alps). In 1871 she learned that her rival Meta Brevoort, an American female mountaineer, was planning an expedition to climb the Matterhorn. Lucy hastily assembled a group and on 22 August, while wearing a white print dress, she became the first woman to stand atop the Matterhorn, and with it gained world renown. Also in that year she completed her fourth ascent of the Eiger during which she is said to have lived on a diet of sponge cake champagne and Asti Spumante. She joined the newly formed Ladies’ Alpine club in 1909, where she was acclaimed as the pioneer of women climbers, and in 1913 became their President. In all, she completed a total of 98 expeditions. She died at her home in Liverpool on the 10th September 1916.